One of the unexpected pleasures of the research I’ve been doing into yoga injuries is that I’ve been drawn into conversations with many types of movement and bodywork folks. I’ve spoken to contact improv people, movement trainers, Rolfers, osteopaths, and dancers. They often have marginal relationships to asana, and I’ve found that their lack of investment in the practice often gives them some startling insight. I recently spoke with Andréa de Keijzer, a 28 year-old dancer and visual artist living in Montreal. In November 2013, after 4 years of hip pain, she underwent debridement surgery for a labral tear in her left hip. (Photo above by Jeannette Ulate.) She expects to be diagnosed with the same injury on the right side, where she has been feeling an identical pain over the past few months. What I find really valuable about her thoughts on asana is that she approached the practice through this awakened lens of injury, and immediately saw that she was being asked to do similar movements — perhaps embodying similar ideals — to those that had been asked to do in dance, which mixed in with anatomical factors such as FAI (femoroacetabular impingement), probably contributed to the development of her condition. Of course we can discuss ad infinitum whether she went to the right classes for her in her yoga-healing experiment, or whether she received good or personalized instruction. Some may wonder aloud whether she really experienced “yoga” at all, although this leaves them in the uncomfortably pious position of needing to define what “yoga” is, and only the truly pious like doing that. I suggest that we let Oscar Wilde be our guide, just for the moment: Those who go beneath the surface do so at their peril. I think it’s highly instructive to hear the raw responses of someone with a wealth of movement training and experience encountering a typical asana class. The two obvious distinctions that might be made between the disciplines of dance and asana belong to the categories of intention and performativity. At first glance, it would seem that the intentions of dance are aesthetic, expressive, cathartic, to communicate inner feeling states, to enact and share with the viewer a rich and wide-ranging story, wordless and impassioned, that pulses towards a silent resolution. But. Um. These actually sound like many of the same intentions of asana practice. Except for the viewer part. But even that might be murky. Asana is often described as being intensely subjective — an inner experience with no observer except that of the non-judgmental, transcendental self. And yet it proposes a vocabulary of movements that are imitated through the visual sense and which function with the synesthesia of touch to hone proprioception, or how one occupies space against the background of the world and in relation to others. Setting traditions of spontaneous ecstatic movement aside, most asana we know today is learned in the same way that all disciplined movement is learned: through mimicry, watching, the firing of mirror neurons connecting to motor neurons. Very few people learn asana without seeing it, and, by extension, without watching/seeing themselves do it. Combine this with the emphasis on “observation” that echoes throughout yoga pedagogy — a much-transformed version of what Patanjalian and Buddhist concentration advises — and it becomes clear that doing asana is intermingled with watching oneself do asana, and therefore being watched doing asana. If we could all learn disciplined movement in isolation, there would be no yoga studio culture at all. We go to yoga studios for some of the same reasons that we go to dance studios: to see others practice and learn from them, and to be seen practicing to receive feedback. In some studios visual feedback is so obviously part of the point that walls are lined with mirrors, to amplify our mirror neurology responses (often at the cost of amplifying dysmorphia). In this specular environment, asana practice is not subjective but intersubjective. Postures are learned and become meaningful in the culture to the extent that they can be shared, and they are most readily shared through vision. Then there’s the fact that the face of yoga culture is actually a body — usually female, young, slender, white, athletic — or rather, it’s the images of that body, as presented through visual media. The body seen in asana is often indistinguishable from the body as seen in dance, with one exception. The lighting, framing, symmetry, and peaceful disposition of the model in the asana photograph is felt to project certain standard psychological virtues. She is balanced, whole, empowered, non-reactive. You can see it in her flesh. Or so you think. The truth is that you are the consumer of a social and aesthetic construction of mindfulness that by definition colludes appearance with virtue. In other words, the very fact that asana is marketed primarily through visual media, and that asana is supposed to imply more than athletic prowess, means that by definition those who are photographed in asana are performing a kind of virtue, whether they personally know it or not. The asana model is performing a desirable internal state. So not only is the asana body indistinguishable from the dance body, so, we could argue, are their intentions. Here’s the problem with the yoga selfie nobody’s talking about. Lying beneath its potential narcissism or failure to challenge social constructions of beauty and health is the fact that it reinforces the most alienating illusion of the advertising State: that a picture can convey the definitive internal reality of its subject. That reality is always presumed to be pleasurable and liberated. But we all know this is not true, because we all know what it feels like to perform to expectation. Some of us know little else. We’re so afraid of not performing enough that we photoshop ourselves into further dysmorphia. Photoshop is the means by which neoliberalism carves even deeper forced smiles onto our faces, after it has cut away the parts of of our flesh we are told to despise. Here is my conversation with her, edited lightly for continuity and flow. My words are italicized. Only the first third or so relates directly to her experience of asana class. 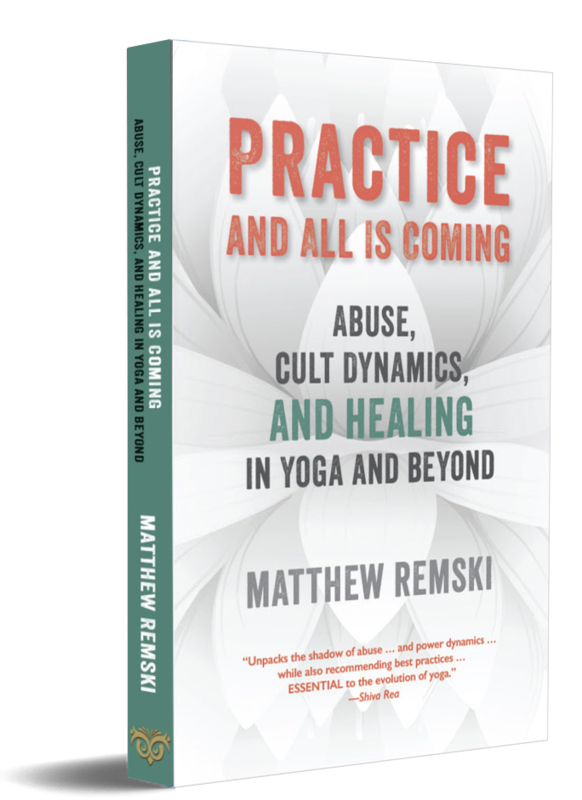 But if, as you’re reading, you mentally substitute the words “dance”, “dancing” and “dancer”, for “yoga”, “practicing”, and “yoga practitioner”, I think you’ll be struck with a number of insights into how our understanding and practice of asana might evolve. ADK: I’ve only done ten asana classes in my life. I always felt there was something fishy about it. In terms of: my body didn’t feel like what was being proposed for it was fullygood for it. So even though I’ve tried, and so many people I trust have a strong asana practice — I always thought “Maybe I should try” — it’s never been something I could do. And then, in the process of recovering from dance injuries and learning more about biomechanics and anatomy, some of the gaps as to why it didn’t feel right got filled in. What were the key feelings and sensations that seemed “off” to you as you studied asana? ADK: The desire and need to go to extremes, whether it was in torsion of the spine or deep parallel flexion of the hips, or hyperextension of the arms. A lot of the stretching felt like it was going to extremes. That didn’t sit well. Neither did the insistence on straight lines and squared hips. Did you have the sense the instructions were leading you towards sensations that you weren’t interested in? ADK: In dance there’s a lot of hyperflexion and hyperextension, and so I’ve grown to like that feeling sometimes. But at that time I was already in hip pain and so that was no longer something I was attracted to. Had I come to it a bit sooner, I would have been attracted to it. Was it confusing to you in terms of purpose? I’m not a dancer, but I imagine that if you’re in dance and you’re going to make a choice towards extreme flexion or hyperextension, the choice is going to carry an aesthetic concern, and maybe a motive of exuberant expression. There might be the acknowledgement “I’m going to give myself to this movement and I know it’s sacrificial.” Did you get the same impression from asana? Why would we move to such extremes? Nobody’s watching, nobody seems to care. ADK: But I wonder about that, because it seems that everyone is watching and everyone is keeping track. Some teachers will highlight the student who does produce the right line, and then you realize that people are watching. There can be a surveillance feeling at times for sure. People try to resist it and not compare each other, but it feels like a failed yearning. Because when it comes down to it the forms are typically established as visual forms, and people are trying to accommodate themselves to those forms. There are practices that don’t do that, but fittingly, they’re less visible in the culture. … and celebration. When I see dancers I feel that they’re sometimes on the edge of ecstasy. I think most visual advertising in yoga aims at producing this impression as well, but in a more controlled, “mindful” way. ADK: With asana I felt there was a desire to create perfect lines that I question in their straightness. Why if our bodies are so rounded, and our muscles wrap around everything so fluidly, why the attention and determination to become a straight line? It felt like something was crooked. Something was not serving the way my body is. I’m not aware of dance being burdened by any overarching philosophy that would direct movement towards abstraction or transcendence. The straight line is an abstraction of nature. We make them in furniture and then we think we can make them in ourselves. Maybe implicit in dance is that the meaning of the form exists because of difference. You can have a straight line in one moment, but that image of rigidity is going to be made meaningful by the next movement being circular or winding. I wonder if the majority of asana tends towards the linear and upright. ADK: But there’s such a spectrum. In dance there are not only similar intense fascinations with lines, but also moving parts of the body in isolation, and not allowing the rest of the body to accommodate to that isolated movement. But there’s currently a shift to movement philosophies, training and practices that are more sustainable. I’m thinking of ballet as you speak, and it makes me want to ask about the intersections of gender and discipline. When I visualize ballet, I see the same demographic as in yoga: the corps is 70% to 30% women to men, it seems. There’s something about the straight line, discipline, the unnaturalness of the form that’s quite resonant with some forms of yoga to me. Do you think that ballet is trying to tell people — women especially — how to be? Is there something in there about obedience? ADK: I can speak from my own path into it. My grandmother had a ballet school, and my aunt was a ballet teacher. As a 3 or 4 year-old, I was at the studio, and I saw it as something good, something that I saw my family enjoy. And then over time what happens is that you’re taught the movements, and taught what is good and what is not good, based on aesthetic values. And then that becomes ingrained into my own perception about what is good and not good. It became entrenched: if my foot is pointed, that’s good. If it’s not pointed, it’s not so good. Not only in my perception of my own body, but in the perception of my fellow students. I would point at them in my heart and saying ‘O, she’s good,’ and ‘O, she’s less good.’ You start differentiating a hierarchy of how good people are at this game. What’s been interesting is that in my transitioning into more biomechanically sound movement, it’s taken a while to shift my visual perception of what to appreciate. Because when I first saw people moving in biomechanically healthy ways, I would feel: I understand that it’s better for them, but I don’t like it, they don’t look good. They looked not-square. The studies that I’ve been doing are mainly through the Axis Syllabus, which is an international research community focusing on the ways knowledge of biomechanics can inform how we move and teach others to move. What I appreciate and find beautiful has changed. Now, when I see someone moving with biomechanical integrity and healthy coordinations, I’m so attracted. It happens much less when I go to ballet or contemporary dance. I can see the lines, but now I can also see through the lines into the stress they conceal. Looking back at how you looked at other women critically in terms of their form or technique, was there a haloing effect? There’s this cognitive fallacy called “The Beautiful Person Fallacy” in which we attribute psychological or even moral qualities to a person based upon what they look like. Did you feel that happening in dance? ADK: Going back to grade school, in which I took ballet every day, I think I must have done that. I was one of the good dancers, and I would only hang out with the other good dancers, more than the girls who had just started or weren’t as good. I recently went back to my hometown and went to see one of my first teachers teach a class of about 15 eight year olds. She said to me in front of them: ‘In this class there are about six jewels’, meaning six little girls who are good. And it made me so sad, because one of them immediately said ‘I’m one of the jewels, no?’ and I could see the other ones who were wondering if they were, and those who knew that definitely they were not. I could see that the jewels were hanging out with each other, and rejecting the others. It does create the fallacy of thinking that being able to do one thing makes you a more desirable person or friend. It’s as destructive for the ones who are jewels as it is for those who aren’t. Being good becomes an addiction. I still feel it, woven into all of my cells. I’m always checking in from this imaginary outside view. So I think there is this wicked transposing of being able to do something physically onto other visions of ourselves. I think it’s a central fallacy in modern postural yoga. As much as we deny it, we promote the view that postural efficiency equates with moral virtue or psychic development. Because we don’t start asana at six years old, I think it’s really good to see how this dynamic can develop in places like the dance world, and how people may bring their experiences of praise and criticism into a yoga studio culture that may not challenge those patterns. ADK: Yes, and teachers bring their own praise and blame patterns into class as well, consciously or unconsciously. I have dance friends who are yoga teachers, and I wonder how much they are able to transcend those effects. If we really wanted to empathize with your teacher who wanted to tell you about the six jewels, what would we think she was getting out of that? Aside from asserting her own authority, how does it benefit her, psychically? ADK: I don’t she’s being intentionally abusive. I think she feels she may be inspiring others to try harder. But there is also a competition between teachers over who produces the best candidates for contests or international schools and companies. If students do well, there’s a feeling that goes beyond joy and into importance. I’m also thinking that the teacher who says that is probably echoing what she heard in her own childhood. In a way, I wonder if that statement is a way of expressing her own self-doubt, as in: am I one of the jewels or not? Because with yoga teachers —despite the parade of selfies — we find a lot of ambivalence in self-perception: doubts about how they’re doing, how much they’ve accomplished, what they have the right to teach, and so on. I don’t know if anyone calls themselves a “yogi” except in a somewhat ironic or peppy social media sense. I think when people start to feel a dedicated drive towards it they’ll call themselves students. That’s also influenced by studio marketing that’s always offering YTT programmes, or multiple ways of “deepening your practice”. There’s always something more to buy and learn, and before long the person who just goes to a few classes starts to self-identify as a student. And then they cross over the line into “teacher” largely through a financial transaction involving a baseline 200-hour training commitment that leaves many in a state of anxiety about how little they know. ADK: Comparing it to dance: there’s the dance student, the dance teacher, and the professional dancer. There is a hierarchy we are taught as children that says if you become a professional dancer, that’s the top, and then the teacher is beneath her. In yoga it’s different because you can’t as easily monetize the performance of your skill. Exactly! The teacher and performer are collapsed into a single role. But the teacher has no one to perform for but the student, because there is no outside audience for validation, except at that very rarified level of the A-list teacher who flies all over the world to meet people once, and who has a contract rider saying what kind of hotel room he needs and what kind of smoothies should be ready for him in the green room. ADK: So that’s like a performance. ADK: Is this just a tendency of our culture that we’ll apply to anything we can get our hands on, whether it’s coming from an aesthetic or a spiritual point of view? Commodification is everywhere. What’s extra painful is that at least on the surface, yoga culture says that it resists those things. In fact that pretense of resistance is part of the branding. ADK: Going back to the injury part: in dance and I think in yoga as well, there’s information that gets passed down as the “good” way or the “right” way, but if you dig down a little you realize that the “right” way often, though not always, refers to aesthetics and not biomechanics. In dance, it comes up through injuries. Now I have a labral tear, and at first I thought: ‘O, I’ve been a bad dancer, I’ve done the technique wrong.’ And then I start looking around and realize that so many of my colleagues have labral tears. It has made me think that perhaps there was something wrong with my technique, but really there is an epidemic happening, and it’s much bigger than myself. The techniques involve extreme rotations, extensions and flexions of the femurs that encourage hypermobility and joint laxity. Once a joint is lax you can take your body parts into all kinds of odd shapes and alignments which over time and with dedication can damage soft tissue around the joints. It feels like the information dancers receive in the beginning lacks an element of choice. I think there’s nothing wrong with doing extreme movement, but what I find sad is that there’s no mechanism of choice, especially at a younger age, in knowing that we’re crossing the line into something risky, but that we’re willing to take that chance. Rather it is sold to us as what we must do to attain the form. So transparency about risks is what dance might be moving towards. Is that part of what the Axis Syllabus Project is about? ADK: Yes. It’s a group of people collecting, sharing and discusing scientific studies, a lot from sports medicine, and finding ways of transposing what we learn to movement, which then gets applied to dance, yoga, circus arts, daily life activities, etc… And it’s constantly changing. So regardless of what we have thought of as a way of optimal moving, if there’s new information about how the foot moves or knee alingment in landing a jump, it is considered. Not as a way of saying ‘This is how everyone should move, but rather making the information available, and letting everyone make a choice about moving away from more optimal alignment and taking risks. By all means we need to take risks, but we should know when we’re crossing lines. But how much of dance in your experience is punctuated by movement that the viewer feels to be extreme or even impossible? I’m thinking of those fMRI studies, where we can see that the motor neurons of dance-viewers are firing, and that their heart rates accelerate as they “participate” neurologically in the dance. I imagine that as the movement becomes more and more novel, the stimulation increases. It’s the extreme movements that will most stimulate a non-dancer such as myself. Do you think that dance can afford to soften up on those movements and survive as an art form? ADK: I’m reminded of why we love circus: because we’re seeing the impossible occur. It also reminds me of how many injuries are hidden in dance, and how that information doesn’t really arrive to the people that are watching. As viewers, we don’t know the price the dancer is paying to create movement that we enjoy. It’s the same as purchasing clothing from places where we don’t know how it’s being made. We just enjoy the food, or the commodity, as consumers rather than community members. It’s becoming a lot harder to remain unaware of the sweatshops in Bangladesh. Just like it’s becoming harder to remain unaware of how in football and hockey, a large percentage of players develop brain damage. I don’t think we get that same feeling with dancers. ADK: That’s why I’m trying to be more transparent about my hip injuries. Because we don’t see it. Or if we do, it’s like: ‘So-and-so got a hip replacement, but she’s back right away doing the craziest movement that she’s ever done!’ My hope is that little by little that people will become more open about their injuries. There was a study that said that the average dancer’s career was 12 years, and that 40% of dancers stopped dancing because of too much pain. But that pain doesn’t go away. The rest of their lives could be lived in pain or periods of reoccurring pain from past injuries. I imagine that 40% is the tip of the iceberg, because there will be a spectrum beneath that related to decreased functionality that also has to do with injury. ADK: We need to become more aware of the price we’re paying, and what for. If it’s made more visible, there’s the possibility for audiences to accept propositions that are less extreme and enter into realms that are more coordinated, featuring rich compositions of space and time, without relying on this one extreme ingredient that excites our hearts. We need to tap into other ways of being interested in what we’re seeing. I’ve seen this shift happen in myself. When I now see really intelligent coordination of the body, I find this so pleasurable, and really inspiring. It’s taking a while for this way of seeing or ethic to enter into dance, but we can see it happening in many other ways in which we live. It’s like choosing a smaller, more weirdly-shaped tomato that tastes better and is grown next door over a perfectly huge red tomato that came from far away and bloated with mysterious chemicals. It takes a while to shift that, and it requires enough information and caring about each other. It’s not only about our own enjoyment. It’s about shared sustainability in our bodies. I can see you going on to form a dance company called “Longevity” or something like that. Rooted in the awareness that up until this point, dance has had this casualty rate, so we’re looking for movements that give us resilience. If that were the project, it would be resonant with what Modern Postural Yoga is claiming to do, but failing at in many ways. Wouldn’t that be amazing, to say as a movement community: our intention is to be and move with each other for 40 years. Some of us will die, some of us will move on, but our project is longevity. Dance would have to include the story of people’s lives as they change. Somebody’s going to get pregnant, somebody’s going to get cancer. How will the most functional and beautiful movements emerge through those circumstances? I just wanted to say a HUGE thank you for committing time to this research and debate. It has been an illuminating read thus far and has certainly given me (a yoga teacher and general movement enthusiast) a lot of food for thought, but more importantly ways to articulate some of the things i’ve been feeling for a while about asana practice. I also wondered if you have ever encountered the work of Peter Blackaby (A Brighton, UK teacher). His book “Intelligent Yoga” is a good introduction to his practice if not, I feel some of what he has to say may resonate with you. The Axis Syllabus is a brilliant resource, I recommend everyone click through and take a look. Hi Rachel — I am getting more and more familiar with Mr. Blackaby… Thanks for the note.